Look at all that snow! I am shivering just thinking about you walking through it! 😉 The machines are gorgeous! I absolutely love old machines. And having all the attachments too? Makes me feel warmer just thinking about it! I’m so impressed that you found the treadle! Our family’s “little house” was originally a two-room house for itinerant farm labor, on a subsistence/tobacco farm in the 1930s-40s, where a family of 10 scratched out an existence. The house the family lived in was built in the 1880s. I don’t know how old the little house was, but from the above description I’m sure you can imagine what a fine dwelling it was. (After my aunt ran away to be married at age 15, she and her new hubby were relegated to the little house. Two of their three children were born while they lived there.) By the time I knew the house, it was abandoned, rotting, and had earned the name “the snake house” for a reason. Don’t know if there was anything in it worth saving, but I’m pretty sure it had been scavenged well before it burned down one summer night. I’m not saying who threw the match. Aww! The first homestead house on the farm was just a two-room shack, as well. It finally finished falling apart in the last few years; no one ever went in as it was used as a chicken coop for years so was pretty toxic. It wasn’t homesteaded until the 19-teens, though… farming in Saskatchewan didn’t really take off until after 1910, when they finally developed wheat with a short enough growing season (Marquis wheat) ;). The Big House was built in 1918, fully plumbed and wired for electricity. Neither of which was really in place until the 1950s. That sounds like so much fun! Did you get to see a picture of the wedding dress? Wow. I am so jealous, you can’t imagine. One of the things I loved about living in Saskatchewan was finding old treasures every where you went. I didn’t love the cold, that wind chill is a killer. I have felt -53.6 with no wind chill and I would take it over -20 in Saskatchewan any day. 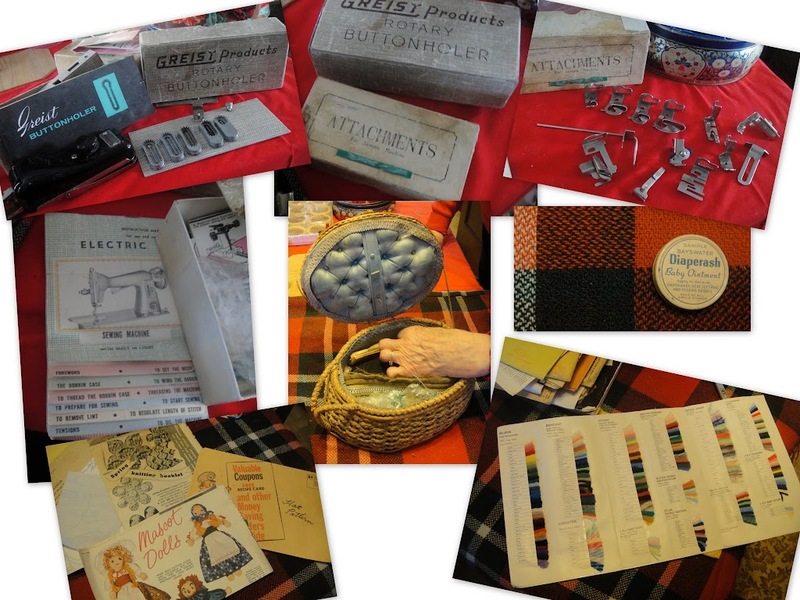 Is your grandma going to give you the treadle? Obsession is as obsession does? This one actually looks in really good shape. Nice thing about Saskatchewan, it’s dry so there is not much tendency to rust. ahh im hooked on antique sewing macines,i have 2 from the 50s and one from the 40s.hubby asked today what i would do when we downsize and i thought a minute and said id rent a storage just for my machines lol.Its a same that old machines are not given the respect they deserve,i would never buy a modern one for anything other than embroidery . How utterly Jetsons. I love it. I think if I was to collect old machines, that’s the kind of machine I’d be looking for. Holy machines! I really loved following you in there to the little house that Grandpa built. I’d go spelunking for an heirloom sewing machine. I lived in the highlands of Cape Breton as a small child, and we would sometimes come across abandoned farmhouses off-road while hiking through the hills. We still have some old chests, bottles and other pickings that we took from those dangerously-falling-down farmhouses. ….and is that a walnut chest of drawers abandoned in the Little House?! The most wonderful thing is having a sewing machine with family history attached, congratulations! Yeah, I do wonder about my “orphan” machines… where did they come from? Who used them? How much? oh oh oh!! You know me and old houses. Wow – did you see that ? birds eye ? dresser in the little house!! And the machines!! Oh man – I love the really old one but the newer one is even a treasurer. Please please record your gramma’s stories before she can’t remember to tell you about them. And I’d take -55 here on the prairies (and I have for that matter) over any where else. It’s a sunny dry cold and the summers are amazing but you are right about real winter versus fun winter – great way to look at it. Did you ever see my interview with Grandma? holy moly, i’ve never heard of the Sphinx treadle until this week when i found out that a labbie and you both got one!! hopefully everything works beautifully and rest assured, i’m completely envious of your vintage machine collection!! I just love how the women in your family sew, still sew and have kept so much stuff for sewing. I look forward to seeing how you get on with trying out the treadle in the spring. I love that blue ‘rocket’ machine! It looks SO stylish. 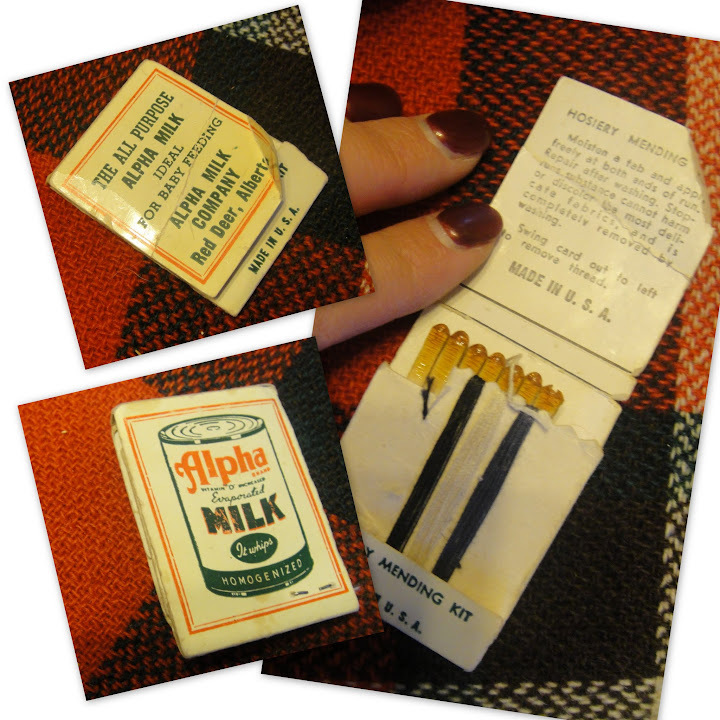 I love the amazing stocking mending kit…. I don’t have Grandparents in Australia and the only Grandparent I met was in Cyprus and died in 2000. He came to Australia alone at 80, having never travelled before on a plane and only one word of English “water”! I saw him a few times in Cyprus too. I went to China a few years ago and it was -20 in Beijing … coming from Brisbane you can’t imagine cold like that, let alone have enough clothes for it! Ha, ha. When I went to Canada a fews years ago also in the winter, I realised I don’t have any ‘snow knowledge’.. what would I do if I fell into a deep hole or something. So strange. Yeah, there’s a surprising amount of “snow knowledge”… Especially when it comes to driving. My grandparents never really knew any of their grandparents. Which is kind of trippy when you think of it. I’m lucky to have them. Wow. Do you have some sort of dowsing rod you use to unearth old sewing machines? Very cool! The manuals are free to download on the Singer site and you can even look up when yours was made and where from the serial number. I have “cast iron fever” can you tell?